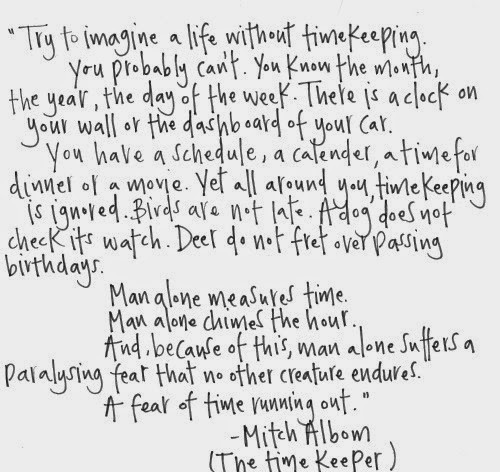 Once upon a time I saw a quote on Tumblr and immediately I googled it to see where it was from, and who's brain could come up with something so tender and beautiful - it turned out to be a quote from a book called The Time Keeper by Mitch Albom. I made a mental note to read it, but life always gets in the way and I forgot about it until I saw the quote again. I put the book straight on my Christmas list, and finally got around to reading it while I was in Berlin last week. The concept of the story is beautiful; Father Time, the first person to discover how time works and to start measuring it, is punished for trying to work out the truth behind the world he lives in, instead of just accepting it. He is banished to a cave where he lives for thousands of years without ageing, and for his sins he is forced to hear every plea for more time, or less time, from human beings throughout the years. Billions of voices merge into one until Father Time pretty much gives up on life. The story is told entirely in third person with an all-knowing narrator, and we follow the story of not only Father Time himself (henceforth known as FT in this blog post), but also a young girl and an old man, both living in New York. To end the punishment bestowed upon him, FT must make these two characters understand the value of time. Victor, the old man, is a character I instantly liked - he's rich and classy and owns homes around the world, which is ideally the kinda person I want to be when I grow up. I liked the character of Sarah, the teenage girl, too; she's your typical un-cool heartbroken teen, and believe me I've been that gal at one time or another. I liked FT himself too, because he was interested in the world around him and he seems like a genuinely nice guy, plus he gets to do some really cool and interesting things in the book. So it's a brilliant concept, and full of likeable characters, funny anecdotes and very clever ways to tie bits of the plot together. However, I don't think I liked it. I know that's an odd thing to say, and the ending did have me in tears on an Easyjet flight, but I'm just not sure about it all. It's well-written, sure, but there were lines which were in bold at the beginning of every chapter, and whenever the story took a slightly new direction: to me this was completely unnecessary, and it broke the story up in a way that was really disjointed and quite frankly, bloody annoying. I also felt parts of the story were ridiculous - I won't give spoilers away because I'm not that sort of person, but some bits just didn't sit well with me. That being said, it's definitely worth the read so you can make your own mind up! Mitch Albom has taken something so important to all over lives - time - and turned it into a fascinating story. If you've read it, let me know what you thought below or on Twitter (@katygilroyblog). This review is part of my ongoing book review challenge, which you can find here, as 'a book you can finish in a day', which I did! This sounds lovely Katy - what a beautiful quote! I'm definitely popping this on my to read list, I don't think I've read anything like this before. Thanks for sharing! I have just finished We Are All Completely Beside Ourselves from your list which had me in tears, so I'm debating whether to put myself through this one! It does sound intriguing though, I love books that make you really think. aw I love that book sooooo much, this definitely isn't as tear-jerking as that one is I promise! !